Jim Elder, born July 25th, 1924, in Altoona, PA, was a professional baseball umpire, executive and broadcaster. 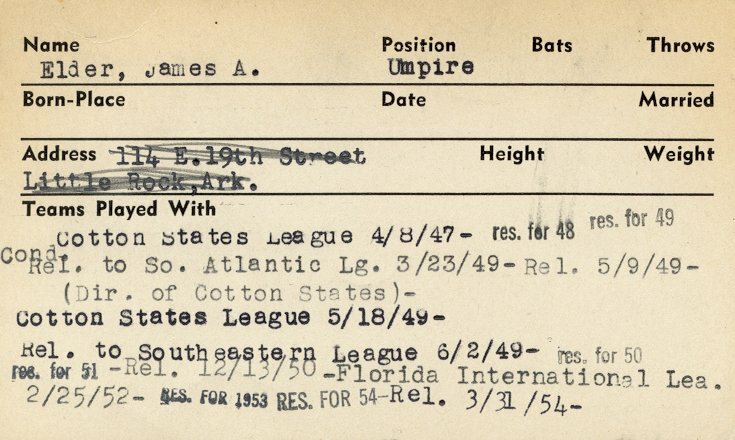 Elder began umpiring professionally in the Cotton States League during 1947 at age 221. Elder briefly umpired in the Sally League in 1949 before returning the CSL. In 1951, Elder became the general manager of the Hot Springs Bathers, a member of the CSL. However, he returned to umpiring the following two years, working games in the Florida International League. 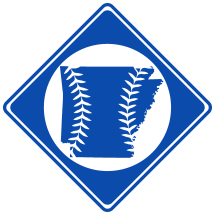 In 1960, Elder began broadcasting for the Little Rock Travelers. He continued broadcasting the team's game for the next 34 years before retiring. Elder died in Little Rock, AR on June 25th, 1998. He was buried in Crestlawn Memorial Park in Conway, AR.